There are only three hotels within Plitvice Lakes National Park but you have a wealth of rooms, apartments, guesthouses, lodges, campgrounds and b&bs outside the park boundaries. Staying just beyond the park boundaries can put you in super-comfortable lodging that's an easy walk from the lakes and waterfalls but if you stay within the park, you save money on visiting the park. Here's how it works: the national park manages three hotels within the park and one just beyond. Stay in one of these four hotels and your daily sightseeing ticket to the park is good for two days, not just one. Just present your admission ticket to the hotel reception on the second day to get a prolongation stamp. Jezero Hotel This three-star hotel within the park and near Entrance 2 is the best hotel in Plitvice with a restaurant, an indoor swimming pool and a sauna. More. Plitvice Hotel is a two-star hotel near Entrance 2 with newly renovated rooms and a restaurant that also provides excellent value. More. 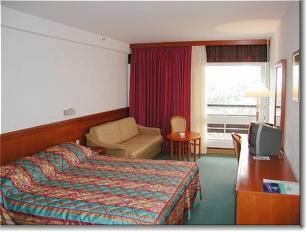 Hotel Bellevue is a two-star hotel near Hotel Plitvice but with much more modest rooms. More. Hotel Grabovac has well-kept, modern rooms in Rakovica, about 8km north of the park. A free shuttle is included. More. North and south of the park are a string of communities with nearly all of Plitvice's guesthouses, B&Bs and apartments. Staying close to the park allows you to save on the national park parking fee. Click on the name to see all accommodation with the community. The community closest to the National Park is Rastovaca next to Entrance 1. Plitvica Selo is also close by, just steps from Auxiliary Entrance 3 and close to Entrance 1. Just south of the park is Mukinje, near Entrance 2. A little further south is Jezerce. House Biba and Leona in Rastovaca gets rave reviews from its guests for the comfortable rooms and location next to a waterfall. 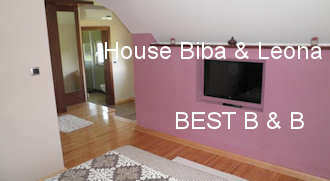 It's one of Croatia's best bed and breakfasts. 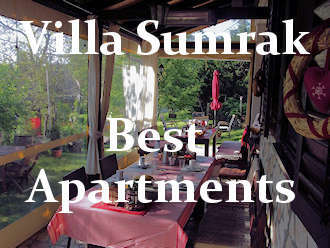 Villa Sumrak in Plitvica Selo provides studios and apartments with terrace, garden and barbecue facilities. Villa Mukinja in Mukinje has double, triple and quadruple rooms. More. House Samardzic in Jezerce has singles, doubles, triples and interconnected rooms . More. Villa Katja is on the same road in Jezerce. More. 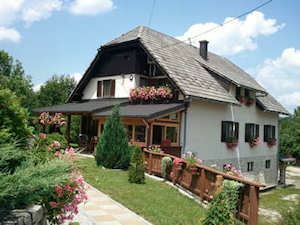 Krizmanic Family B&B is an old favorite in Rastovaca with renovated rooms, a buffet breakfast and air conditioning. House Jelena is 6km north of the park in a quiet, rustic location. More. Bungalows Korana offers rustic accommodation and camping 6km north of Plitvice. Autocamp Borje is 15km south of the park and offers comfortable facilities.